A 2nd card I have made today using toppers and card stock from the mulberry wood pack, also a tag from the mulberry wood pack. White ribbon with blue writing saying merry Xmas to you. 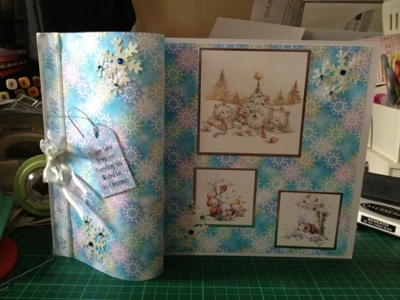 Then some glittered card which I have punched snowflakes and added gems in the middle. Gorgeous papers and the toppers and tag is fabulous.